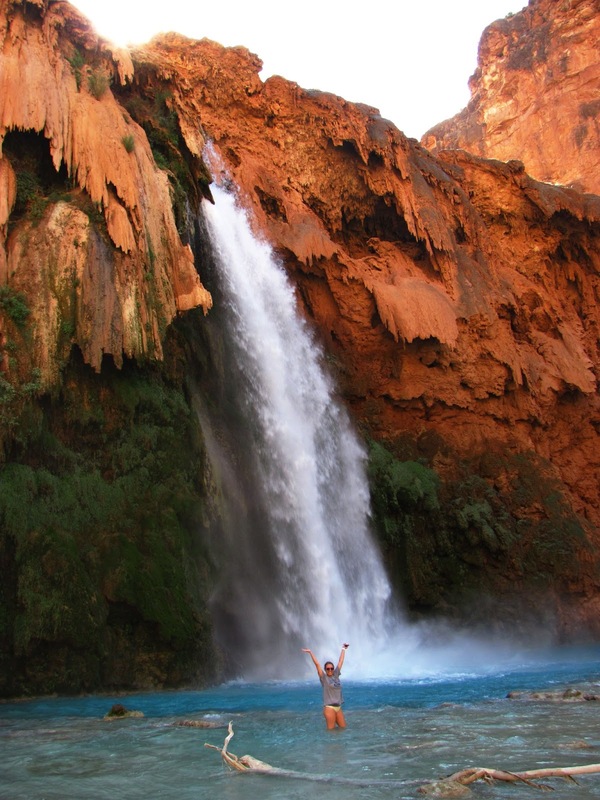 For a lot of hikers, a trip to the Supai reservation in the Grand Canyon to see Havasu Falls is the high watermark of a lifetime of exploration and adventures. I’m in my early thirties now, and I thought it was time that I made the journey myself. After doing a lot of research online, I became an expert on Supai before I had ever even visited. Most people agree that the best times to visit are during the spring and fall when the temperatures are mild and the crowds are thin. I reserved my campsite by phone for early October about 6 months before of my trip. For three people staying two nights in the Supai campground, the fee came to exactly 85$ per person. You don’t actually pay for anything on the phone, they just give you a reservation number. The lodge was already completely booked, but the prices for a room were several hundred dollars more expensive and I wouldn't have spent that much money anyway. The next step for our trip was gathering supplies and planning the route. 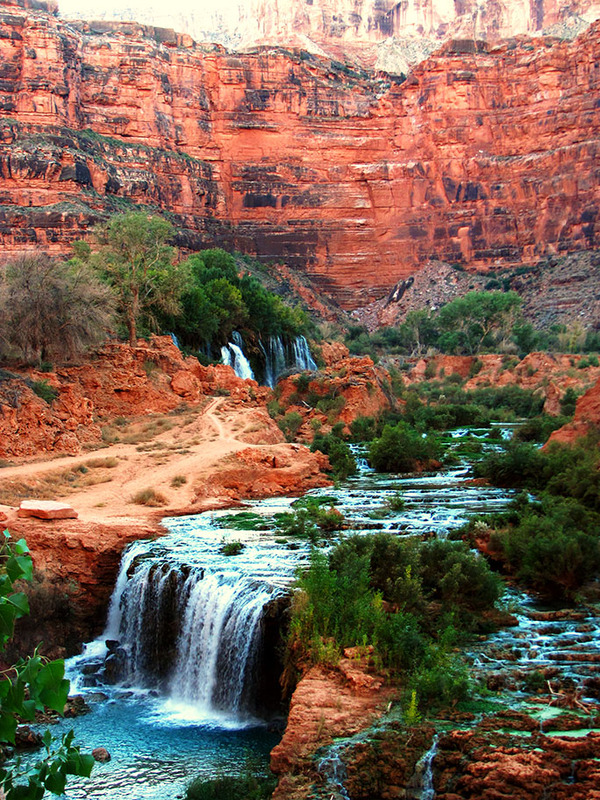 The major factor to consider in the Grand Canyon is always the weather. Summer temperatures can reach 120 degrees. In the winter, they regularly drop below zero. Temps in the spring and fall can be unpredictable. In early October, the weatherman called for clear skies with daytime temps in the low 70’s, and nights in the upper 40’s. Perfection. The hike to the campground in Supai is ten miles each way from the parking lot at Hualapai hilltop. To clear up any confusion about directions, the best route from either direction on Route 40 is to take route 66 and then exit North on Hualapai Highway (Indian Route 18). You just follow the Hualapai Highway for an hour or so until it dead ends at the parking lot for Hualapai Hilltop. It should be hard to miss. It’s the parking lot situated on the edge of a billion year old crevasse 1 mile deep and 18 miles across. 3 hours, including a 20 minute stop for breakfast at McDonald’s. We left our car in the free parking lot and we started our hike from Hualupai Hilltop at around 10 am. During the initial descent into the canyon, we had to yield the trail a half dozen times to the mules and men on horseback carrying men and gear out of the canyon. The trail itself was well maintained and easy to walk on. 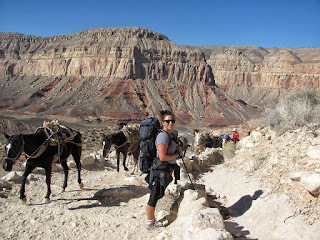 We hauled all of our own gear into the canyon in our packs, so we traveled at a relatively slow pace. We stopped to take a ton of photos along the way and ate a pre-packed lunch about 2 hours into our hike. 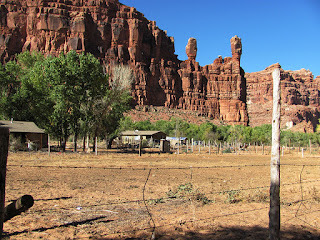 We made it into Supai village a little before 2 pm and paid our fees in the office. We bought our food for the next two days in the general store in village and lugged it with us the last mile and half to the campground. The trail through the village is sandy and it feels sluggish to walk in, but the waterfalls on the trail will distract you. The campground was first come/first served and we were able to get a prime spot right next to the creek away from everyone else. We spent the next two days exploring the waterfalls in the valley. There were very few hikers in the valley. 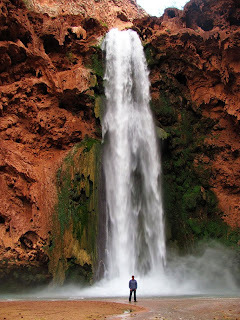 On the final morning, we decided to wake early, pack up camp, and take the helicopter out of the canyon from Supai village to Halupai hilltop. 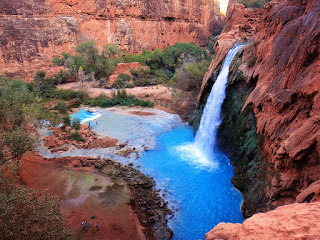 The price for a ten minute flight was 80$ per person, but it saved us 4 hours of utter exhaustion hiking out of the canyon. It was a decision I don’t regret. All in all, this was the most beautiful and most gratifying camping trip that I've ever been on. The Native Americans we encountered were friendly and extremely helpful. 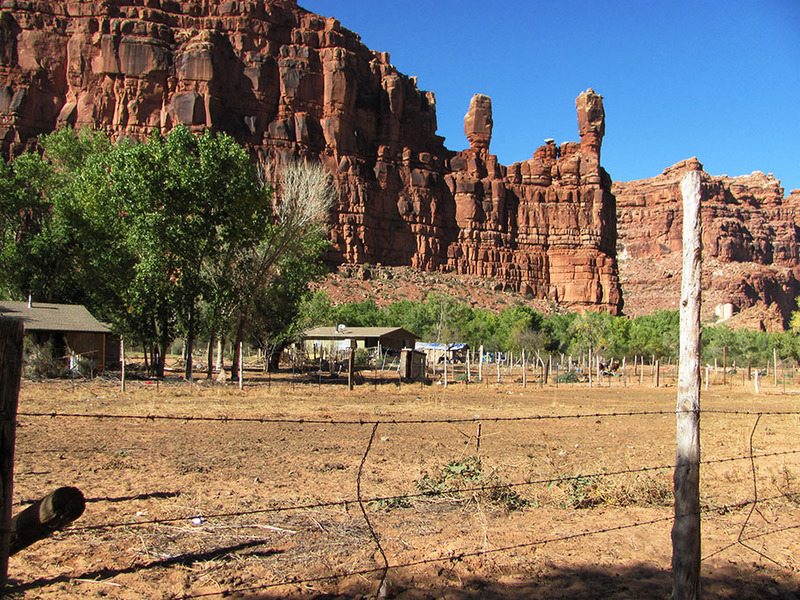 The canyon is nearly devoid of trash because of the tireless efforts of the Native Americans to keep it clean and haul out trash. This is an adventure that I will definitely be taking again, maybe even as soon as this fall.